WANG Xin, CAI Kai, WANG Liang, DAI Zhihong, WAN Huqiang, LU Xiangfu, LIU Zhiyu. Analysis of Predictors of Bone Metastasis in Prostate Cancer[J]. Journal of China Medical University, 2018, 47(11): 1025-1028. Abstract: Objective To analyze the correlation between diverse clinical factors and bone metastases of prostate cancer. Methods The clinical data of 314 cases with prostate cancer between January 2013 and July 2017 were retrospectively analyzed. These patients were divided into control and experimental groups. Univariate and multivariate logistic regression analyses were conducted on prostate cancer bone metastasis-related factors. The cutoff value, sensitivity, and specificity of the independent correlation factors were calculated. Results Single-factor analysis revealed that clinical T stage, Gleason score, prostate specific antigen (PSA) level, PSA density (PSAD), and alkaline phosphatase (ALP) level correlated with bone metastasis (P < 0.001). The logistic regression analysis revealed that clinical T stage, PSA level, and ALP level were independent factors of bone metastasis (P < 0.05). The cutoff PSA level, PSAD, and ALP level were respectively 48.3 ng/mL, 0.9 ng/(mL·cm3), and 91.0 U/L, with sensitivities of 81.2%, 80.5%, and 61.7%, and specificities of 77.9%, 72.4%, and 88.3%, respectively. 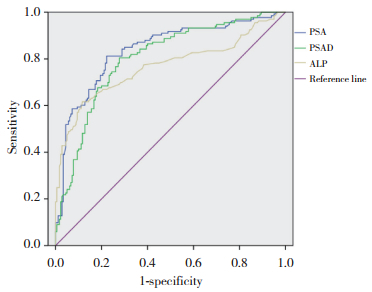 Conclusion PSA level, clinical T stage, and ALP level are the predictors of bone metastasis of prostate cancer. When PSA >48.3 ng/mL, PSADs >0.9 ng/(mL·cm3), and ALP >91.0 U/L, we suggest that whole-body bone scan is helpful in the early diagnosis of bone metastasis and timely treatment. BM，bone metastasis；NBM，no bone metastasis；PSA，prostate specific antigen；PSAD，PSA density.